We have selected three nearby schools for the above-mentioned project. For five days a week, we supply food items to the school children. We also supply them with bags, umbrella, shoes, notebooks, sports items. In the evening we hold a coaching class for the neighbourhood school-going children. On Saturdays we have a moral education class and a Gita Chanting class. 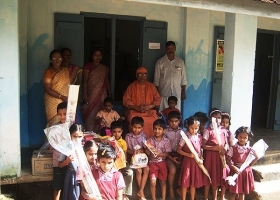 Further interested children attend a Sanskrit coaching class on Sundays. 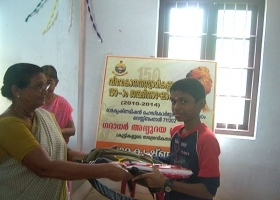 As part of the Onam celebrations, a one-day competition programme was held at our campus. Various competitions like painting, drawing, quiz, etc. 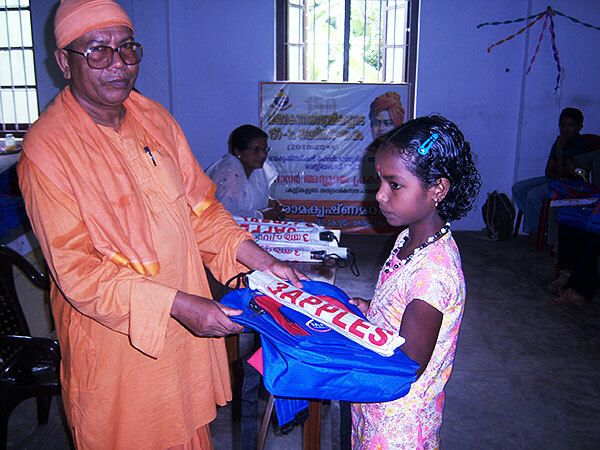 were conducted for school-going children and prizes were distributed to the winners. We also arranged a Onam-Sadhya (feast) for the children. We conducted a half-day ‘Gita, Navaratna Malika Stotram, Vivekananda Sayings’ chanting competition on October 14th 2012. 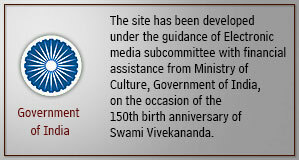 We received a good response. The chanting competition was held on 14th October 2012, Sunday, at our College Auditorium & classrooms. 210 students from 8 schools and 3 colleges took part in the competitions. The prizes were distributed on the Vijayadasami day (24th Oct, 2012) at our College Auditorium.